To save 30 per cent on the book’s cost, order online by December. Passed in 2000, the United Nations Security Council Resolution 1325 and subsequent seven Resolutions make up the Women, Peace, and Security (WPS) agenda. This agenda is a significant international normative and policy framework addressing the gender-specific impacts of conflict on women and girls, including protection against sexual and gender-based violence, promotion of women’s participation in peace and security processes, and support for women’s roles as peace builders in the prevention of conflict and rebuilding of societies after conflict. Implementation within and across states and international organizations – and within peace and security operations – has been slow despite significant transnational advocacy in support of the Women, Peace, and Security agenda. ‘The Oxford Handbook of Women, Peace, and Security’ brings together scholars, advocates, and policymakers to provide an overview of what we know concerning what works to promote women’s participation in peace and security, what works to protect women and girls from sexual and gender-based violence and other human rights violations, and what works to prevent conflict drawing on women’s experiences and knowledge of building peace from local to global levels. And just as importantly, it addresses the gaps in knowledge on and the future direction of scholarship on Women, Peace, and Security. The handbook particularly aims to build on the findings from the 2015 Global Study of Resolution 1325, commissioned by the UN-Secretary General. 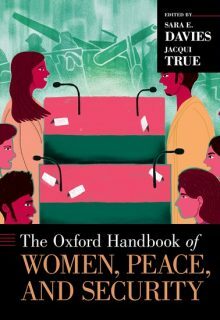 Over the course of six sections, the handbook addresses the concepts and early history behind Women, Peace, and Security; the theory and practice of Women, Peace, and Security; international institutions involved with the Women, Peace, and Security agenda; the implementation of Women, Peace, and Security in conflict prevention, peace operations, peace building, arms control, human-rights protection, and protection of civilians; connections between Women, Peace, and Security and other UN resolutions and agendas; and the ongoing and future challenges of Women, Peace, and Security. Its editors are Sara E. Davies, Associate Professor and Australian Research Council (ARC) Future Fellow, School of Government and International Relations, Griffith University, Australia, and Jacqui True, Professor of Politics & International Relations and Australian Research Council Future Fellow, School of Social Sciences, Monash University, Australia. Sara E. Davies is Associate Professor and Australian Research Council (ARC) Future Fellow in the School of Government and International Relations at Griffith University. She is also co-founder and co-editor of quarterly issued international journal Global Responsibility to Protect. Jacqui True is Professor of Politics and International Relations and Australian Research Council Future Fellow in the School of Social Sciences at Monash University. She is also an editorial board member of the International Feminist Journal of Politics; the International Studies Review; Global Responsibility to Protect; Political Science; and Women, Politics & Policy, and the author of The Political Economy of Violence Against Women and co-editor of Scandalous Economics. And the Women’s International League for Peace and Freedom (WILPF) has several chapters in the book: Madeleine Rees, Secretary-General of WILPF; Joy Onyesoh, WILPF’s International President from WILPF Nigeria; Reaching Critical Will’s Director Ray Acheson; and Director of Programmes Maria Butler have contributed to various chapters of the book, including on the international arms trade and gender-based violence. The handbook is due to be published on 28 February 2019, but may be pre-ordered now. To save 30 per cent on the book’s cost, order online here by December with promotional code AAFLY6.